Beef Wellington is a rich, complex dish that marries many flavors and textures. Selecting what to serve with it can be challenging; the dishes need to complement the array of tastes without competing with them. Side dishes can sometimes share the stage with an entrée, but as evidenced by the recipe for Beef Wellington, the main dish will reign as the star of the meal, no matter what else is served alongside it. Traditional sides for simple beef entrees like chateaubriand or standing rib roast like creamy scalloped potatoes, sauced vegetables or pasta are too heavy to serve with this dish. Their flavors would compete with the entrée's richness. Even the customary side of bread is redundant when served alongside a pastry-crusted entrée. 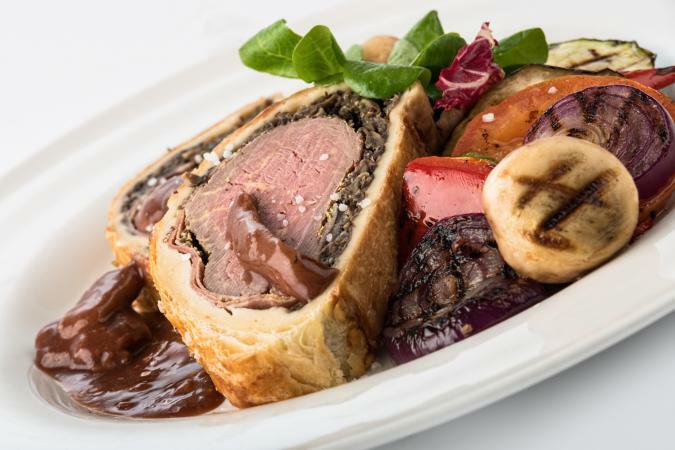 Vegetables can add a dash of color to the presentation of Beef Wellington, which is needed to offset the dark, earthy colors of the beef and its coatings. Keep simplicity in mind when looking for a vegetable side dish to serve with this dish. Serve a crisp, fresh salad mainly composed of greens and lightly dressed with a non-creamy dressing, such as balsamic vinaigrette. Grilled fresh asparagus flavored with nothing more than salt, pepper and butter is a delicious option. Fresh green beans are a good option to pair with this dish, particularly if you opt for a simple recipe that calls for sautéeing in garlic and white wine. Broccoli is an excellent side to serve Beef Wellington, whether you steam, sauté or roast it. Brussels sprouts flavored with olive oil, sea salt, pepper and a light sprinkling of Asiago cheese can be a tasty choice. Fresh beets are an unexpected and colorful side for this dish. Use a basic recipe for boiled beets or consider roast beets with balsamic glaze. A carrot puree would also complement the rich flavors of the Wellington and add a touch of bright color to the presentation. Although fancy potato dishes are too cloying to be served with Beef Wellington, simply prepared ones are perfect additions to the meal. Herb roasted potatoes are a better potato option for Beef Wellington than potatoes prepared with a heavy sauce. Pan-cooked sautéed or oven roasted fingerling potatoes are another delicious potato pairing selection. Baby red or Yukon potato varieties can complement the flavors of the beef dish without overpowering them. Mashed potatoes can also work well, though go with a lighter than traditional recipe featuring fat-free and reduced fat cream cheese, sour cream and milk. Basic white or wild rice prepared in a rice cooker is a simple, yet tasty side dish option for this rich main course. Brown rice pilaf is a delicious and healthful option to add flavor and fiber to your meal. Couscous can be served in a variety of ways that work well with Beef Wellington; perhaps the best option is a basic herbed couscous pilaf. Consider serving a side that combines veggies (or even fruit) with a starch. You won't want to serve a heavy casserole, but there are a number of combination side dish options to consider pairing with Beef Wellington. Celery root and potato puree is a fancier option that basic mashed potatoes. Garnish it with fresh chives for an extra dash of color. Cranberry rice is an interesting pairing for this rich dish, particularly if you are serving it for a holiday or New Year's Eve celebration. Risotto with mushrooms is an elegant side dish pairing for this main course. Top it off with shaved truffles for a super-special, upscale touch. A side dish that pairs Brussels sprouts with sweet potatoes is a flavorful and nutritious accompaniment for this main dish. Add a bit of a sweet flavor to your savory beef main course with a side dish featuring the unique combination of baked sweet potatoes and raisins. A vegetable and rice medley that pairs white rice with carrots, peas, celery and onions is an interesting accompaniment for Beef Wellington. Combine new potatoes with bell pepper, zucchini and mushrooms for a flavorful oven roasted potato and vegetable dish that goes perfectly with this beef entrée. If you are looking for new side dish ideas for Beef Wellington, look online for a restaurant that serves the dish and check out their menu to see what they list or suggest to be served with it. Or, if you want to cast a wider net and search for even more options, looking for relatively simple sides that will effectively partner with the rich flavor of this complex and delectable dish.